Editor’s note:Laurence Brahm, first came to China as a fresh university exchange student from the U.S. in 1981 and he has spent much of the past three and a half decades living and working in the country. He has been a lawyer, a writer, and now he is Founding Director of Himalayan Consensus and a Senior International Fellow at the Center for China and Globalization. Beijing, winter 1992. It was a cold dreary late winter day. Peering out through my office window, the city looked grey-yellowish and flat. Nobody could foresee that vast construction sites would sprawl in every direction over the coming years devouring all that low-rise space. Old factories and outdated storage barns would soon become mega-high rises with some of the most sophisticated office and retail space. But nobody could even imagine such things looking out at coal smoke stacks from that island of international offices called China World. My office was located in the China World Trade Center. In 1992 China World was a single lonely modern office tower rising over China’s capital, connected to the Shangri-la managed hotel. There was not much else around it. I remember as a young lawyer working on drafting the construction contracts for China World from our office at the CITIC tower in 1986, then the most modern office in Beijing. As most of the foreign community was crammed into the Peking Hotel or the Minzhu Hotel, Wang Fujing was the central business district. People questioned Singapore tycoon Robert Kwok’s vision investing in the China World Trade Center. “It seems so far outside of town, who will actually go there?” asked many in the expatriate community at the time. Decades later the China World Trade Center would be dwarfed in a vast sea of high-rises, and would become the center of Beijing’s “CBD” Central Business District. But in 1992 that lonely office tower was almost empty. Only a few foreign firms bothered to keep a presence there. Working for what was then Hong Kong’s largest law firm, Johnston Stokes and Master, I was assigned to build their China law practice in anticipation of things yet to come. Nobody could really imagine the future at that moment. Staring out through the coal-polluted and dust-smudged windows I was trying to visualize how to make this happen. There were no foreign investors. Those few foreign companies were maintaining a symbolic presence through representative offices. There was no sign of any business anywhere. My thoughts were interrupted as our Hong Kong secretary briskly opened the door to my office with a sense of tense efficiency. She had a concerned look “Several Chinese officials are waiting in the reception to see you. They say they are your ‘old friends’ ”. I went down and spotted Yu Xiaoyu, stretched on an institutional blue couch as if he owned the place, accompanied by two other officials. Yu, a burly Beijing’er, exuded the confidence and crassness of a New Yorker. Yu was personal secretary to the Minister of the State Commission for Reform of Economic Systems (going by the obscure acronym SCRES), and from his position had insight into a major shift about to happen. The SCRES served as the premiere’s think-tank. 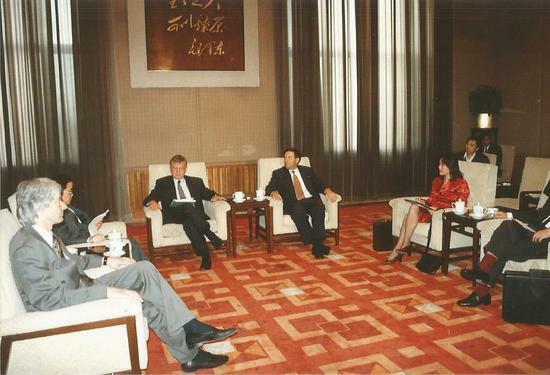 With far-reaching power to oversee other ministries in guiding the transition from planning to market, it was one of the most powerful organizations in the Chinese government, and key in coordinating often different interests of the various industrial line ministries in order to get things done. Over steaming cups of jasmine tea back in my office, Yu whispered of changes and shifting alignments in policy that we could not see as outsiders. He told me not to underestimate China’s potential to move forward with major reforms in the decade ahead. Then he whispered, something was about to go down. It would happen that spring. A group of reformers realized China had to quickly get out of its economic stagnation that began as the decade before ended. Foreign investment was needed. So was a market economy. But stodgy views within the conservative establishment were slow to realize this. So something big had to be done. In 1992 reform-minded leaders in the central government were planning for elder Deng Xiaoping to take a “southern inspection” of the special economic zones that Xi Zhongxun (father of current President Xi Jinping) had pioneered as market experimental laboratories across from Hong Kong and Macao a decade earlier. It was all about sending messages to open the valves of China’s economy. The Special Economic Zones – little export processing areas across the border from Hong Kong and Macao – were China’s first inroads into a market economy. They were controlled experimental laboratories strategically placed across the then border from Hong Kong, Macao as well as in Xiamen across from Taiwan. The purpose of the “southern inspection” was to review progress in these market laboratory zones established a decade before, moreover to declare the experiment a success. The next move in the plan was to call for the whole country to become a “market economy” albeit a “socialist” one with “Chinese characteristics”. Up until that moment officials never used or even uttered the phrase “market economy.” Now they had a green light to begin to open up the market. From that moment everyone seemed to jump on the business bandwagon. Investments rushed in from Hong Kong and overseas. An era of accelerated hyper-growth ensued. Reforms began across the board. In China the ideological debate between socialism and market had come full circle. And the rest of the world would never be the same.